New Grass Stitcher Video: We just received a new video of the Grass Stitcher. The video shows how to use the tool to repair damaged lawn areas. Proper Technique: The video shows how to keep the tool vertical and either use your body weight or you can use your leg power. Epic Mower: Yesterday we had a phone call from a customer who purchased an Epic Electric Solar Mower from us last year. He spoke highly of his experience. He mows his lawn every week and uses two batteries to complete his lawn. Two Batteries: One stays in the Epic Electric Solar Mower and is used to mow. When the first battery runs out, he replaces it with the second battery which has been on the charger. The batteries power the mower for 45-50 minutes. 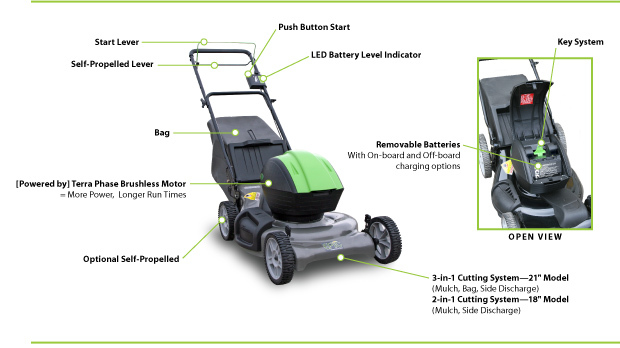 Other Benefits: One feature he really likes is that the batteries power the mower fully for the entire time. There is no drop off in the energy supplied. 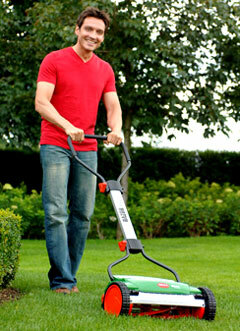 Mowing Tips: Our customer has also noted that the mower works best when the grass is dry. And the mower works better when it is above 50 degrees. Double Cutting, North-South cutting, Regular cutting. What is Double Cutting: Double cutting means pushing your reel lawn mower along a line and then reversing direction and cutting the same path again. This is recommended when the grass is long and thick. What is North-South, East-West Cutting: This means pushing your reel mower across your lawn in a north south direction. When you are done with your lawn, mow it again pushing your mower in an east west direction. This is also recommended when the lawn is thick or long. This method is often recommended for Bermuda and Zoysia lawns. Regular Cutting: If you can it is recommended that you mow with your reel mower every four or five days during late-May and June. When not mowing during these periods, mowing once a week is recommended. This would assume you are not double cutting or north-south, east-west cutting. One vision: I have this vision of many folks going to the YMCA or exercise facility for which they pay. Paying a babysitter to watch their children while they excercise, and paying a landscaper to mow their lawn. Second vision: Then I have this second vision of folks who mow their own lawn as a family activity. Thereby saving the exercise fee, the babysitting fee, and the lawn mowing fee. Third vision: The Hills Clotheslines will save you on your electric bill and give you beautifully dried clothes. Many models to choose from to suit your drying needs. The newly designed Brill Razorcut mowers are continuing to get great customer feedback. We have noticed that a few customers have had assembly problems which we have resolved quickly, however here is some preventative advice. The handle assembly involves a bolt, nut, and small black plastic spacer. You want to be careful not to over tighten the nut when assembling your handles. If you tighten too much the plastic spacer can crack. So try not to tighten the nut and your handles will work fine. If by chance you do crack the spacer, email us your name and invoice number, and we will send you a replacement part. We are often asked which mowers cut Zoysia Grass well. We are so pleased that this new mower is on the reel mowing scene- The Silent Cut 18 and Silent Cut 21 Reel Mowers do a fine job on Zoysia Grass (and Bermuda). Silent Cut mowers are made in China for an Amish company which maintains a high level of quality control over the product. They insist on it being made to their specifications, and they do open, inspect, adjust, sharpen and lubricate each one before shipping. Two year warranty, U.S Based. There is a two year warranty and parts will be available for a long time. I often point out to people that there is a big difference between a Chinese company coming over here, buying products and going back to make knock-offs, and an American company that contracts with Chinese factories for labor they cannot afford to pay for here. Worried About the transition to reel mowing? We have a great guide to help you transition your lawn properly to a reel mowing method. If you have any problems we are here to help.